If you have been following this blog for a while, you should know by now that I am addicted to shrimp. Here is my simple and healthy (since it’s loaded with garlic!) shrimp dish that is extremely simple to make. Just chop off the eyes part of the shrimp head, make a slit down the back, remove the vein, steam and then top them off with heaps of garlic oil. With such versatility and wide range of flavors, now how can I not love shrimp?! Here is my simple and healthy shrimp dish that is extremely simple to make. Just chop off the eyes part of the shrimp head, make a slit down the back, remove the vein, steam and then top them off with heaps of garlic oil. Heat up the wok and add in the cooking oil. Lightly fry the chopped garlic until they turn golden brown. Set aside. Chop off the eyes part of the shrimp head, slit the back and deveined. Pat dry and place all shrimp on a plate. Season the shrimp with the ingredients above. Steam for 5 minutes. Top the shrimp with the garlic oil and garnish with chopped scallion. Sounds easy enough, and looks incredibly artful! Yummy. No drops of soy sauce (“si-yau” / “tau-yue”)? Yikes! They’re high in cholesterol too? Had no idea. I love shrimp too! me luv shrimps too. the only food i will eat whatever it is cook. er… actually it is only the head that is full of cholesterol. body part only teeny weeny percentage of cholesterol. anyway, other shellfish like squid is said to be higher in cholesterol than prawns! 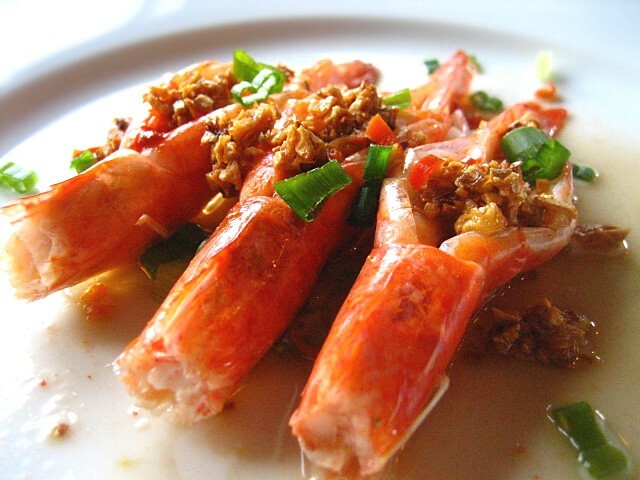 BY, this shrimp recipe indeed look so simple… and i’m sure very yummy since i like garlic and shallion. Those shrimps look marvelous! Yummy! wah..this one so easy leh..NO NEED TO PEEL DEM PRAWNS!!!!!!!!!!!!!!!!! cool!! will try this asap! one of da best pixs of ready-to-eat prawns ( or shrimps ?) V have ever seen! Or will ever see? Oh my! This looks scrumptious. You’ve taken three ingredients I love (shrimp, fried garlic, wilted scallions) and put them together! Does the shrimp shell get eaten too or is it too tough after steaming? I love deep fried shrimp shells. Don’t listen to WC. The cholesterol in shellfish isn’t the bad kind. It’s actually good for you. Eat all you like! It looks gorgeous… I’d never seen shrimps prepared that way, it’s very classy! I’ve eaten similar dish in restaurant before…yes…very garlicky but it’s good! I think I want to try this too!The prawns like “procreation” mode…buahahah!LOL! More prawns for you! Oooo..yummy..i like my prawns steamed too for maximum sweetness. But usually i put raw garlic to be steamed together with the prawns. Next time will try your version. OMG, they are so beautifully prepared. It looks yummy! But only three shrimps? Apa macam? Chien fay-ah? RM, it looks delumptious (delicious & scrumptious) as always. bee, those shrimp are stunning! Is it difficult to split them down the back and prepare them like that? In Korea there is a similar shrimp preparation, but the shrimp is steamed, then covered with minced hardboiled egg yolk and egg white. It is pretty, but looks time consuming. So happy to find your blog because like you I can eat shrimp all day. Are the shrimps expensive at your place? Looks simple and delicious. I wonder if the shrimp will curls up when steaming them? gawd, i mean, u r a real cook! i m amazzed. steamed prawns my favourite too!!!!! i like those with egg custard as well….yummy! what a lovely presentation! looks delicious!! SC – I like minced ginger too, but mostly with steamed fish. Tummythoz – I used fish sauce and salt instead. Christine – Eat first think later! Lucia – true. I heard squid is the worst. So don’t worry, keep on eating our favorite shellfish. Rosa – thanks, I will check it out. TeamBSG – I wonder how they would look with my new camera. Hehe. Claude – you don’t like garlic? ChubbyPanda – yes, I agree with both hands and both legs. For shellfish, I will eat them without thinking. Mallika – yes, eat first and don’t think. Vero – I secretly think that Claude is both vampire and dislike garlic! LOL. Ming – aiya, of course more than 3 lah, but for food photography purposes I show only 3. Show all not nice one. Sam – there is only one thing that is constant in my fridge, shrimp. I never run out of it…if I ever do, I would declare it an emergency! LOL! Kok – shrimp is extremely cheap in the US. Usually average at $4.99/pound, and sometimes when it’s sale, it’s only $3.99/pound and I am talking about big ones not the tiny ones in Malaysia! Suanne – yes, they curl up…so what I did is I slit it from the head towards the end of the tail. Meiyen – yes, I love clams steamed in egg custard soooo good. I’m going to make these next week! The presentation is so artful. Its hard to find shrimp with head on here where I live though. I used to make a mason jar full of the garlic oil and use that to top steamed vegetables, but recently read that home made garlic oil contains toxins if you do not refrigerate it and leave it out. 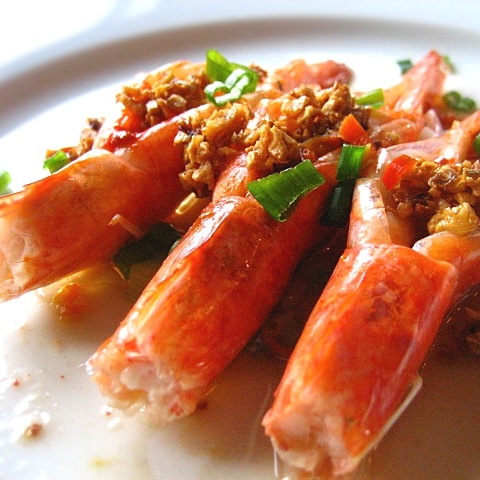 I love your steamed shrimp with garlic oil recipe. It sounds very easy. 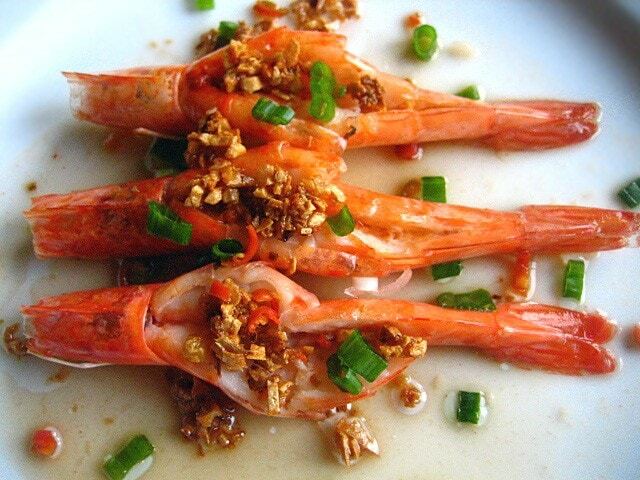 I must try to make this steamed shrimp with garlic oil. Shrimps are not high in cholesterol. Actually shrimps are good for lowering cholesterols. We Asians, have been eaten Masak Lemak Daging Salai, Gulai Udang, Pucuk Paku Rebus n Sambal Belacan for many generations.. had no prob with health until……. the low fat stuff came. We all get sick..